What I really want to do right now is head down to the Des Moines Art center and take a good, long, thinking sort of walk. But, unfortunately, I’m five hours in the wrong direction to make that a reality, and beside that, they’re likely closed for today anyway, so I did the next best thing -hit up google images for my old favorites. In the museum, they’re rarely displayed in the same place twice, and it’s always fun to see where they’ve moved some of them. 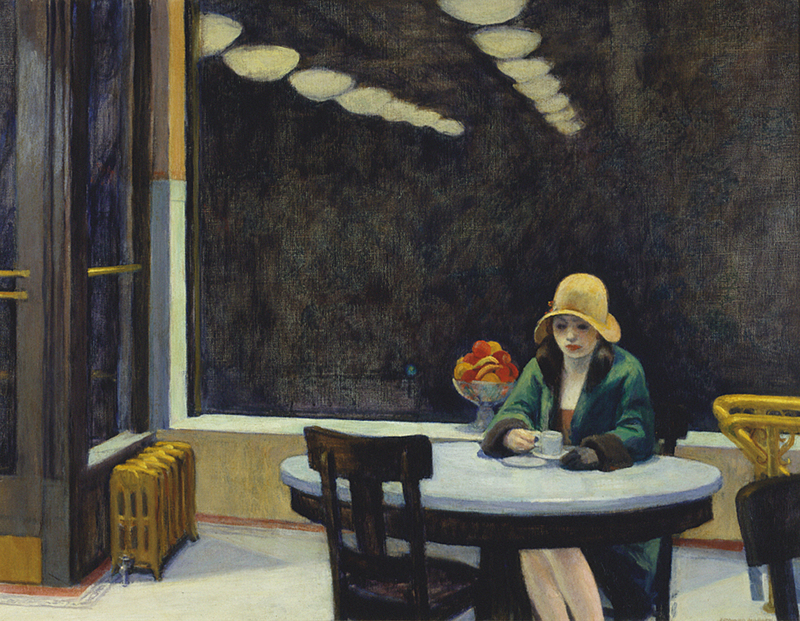 Last time I was there, my friend Automat by Edward Hopper was out on exhibition (or, as I prefer to think of it, on vacation), so I missed seeing it. …Actually, I need an inspiration to get going on a story for class, and I think I might use her. Standing in front of that painting, I always wonderred just what she was thinking about. It’s the sort of picture that makes you curious, as if you were in the diner with her, just at the next table, trying not to be too obvious about scanning her for details of why she’s looking so forlorn there in the corner, with her cup of coffee. Or maybe it’s tea… she seems more of a tea drinker, doesn’t she? Maybe I’ll figure out why. You really have to be standing about a foot in front of the original to fully appreciate it, in my opinion. It’s an oil painting, and my favorite thing to examine was the bracelet on the girl -you can see the brush strokes he used to make the gold in the bracelet gleam at a distance. It’s really amazing to see it close-up and then slowly back up to get the bigger perspective. The focus of the piece is wonderful, too –it’s how I see things (I don’t know if everyone does this) –I see certain things in perfect, crystal clear detail, the rest fades into the background. Almost a three-dimensional effect he achieves here. 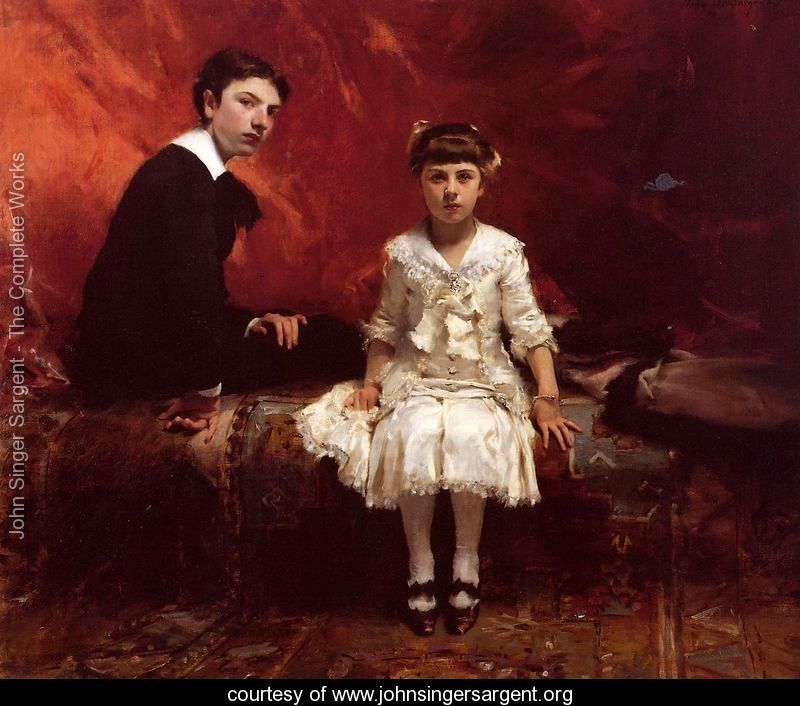 I wonder what kind of an experience Sargent had posing this pair. The girl looks like she’d much rather be on the other side of the canvas, seeing what the artist is doing, maybe playing in the paints –or maybe she’d rather be reading a book, or outside. Anywhere but sitting stock-still for a portrait in pretty clothes. She looks like an interesting little girl. I think I’d have liked to be in the room. You can almost hear her brother, who is obviously more experienced at portrait-sitting, scolding her for fidgeting. He must be about thirteen or fourteen, I’m guessing. She has got to be nine or ten. There’s a confidence and a pure honesty about that age that she has about her. I hope she never lost that. Anyway, it’s one of my favorites, almost always in the room to the left, as you go in the main entrance, with the other impressionist pieces. I can always count on it being there. I’m running out of room to put images of the rest -if you move downstairs (unless they’ve moved it), there’s an installation by George Segal called To All Gates that I just couldn’t understand, really, until I got older. It’s a scene from an airport -plaster people frozen in time. Feels sort of eerie, but for me now, it makes me feel at home, right there at the bottom floor in the corner where it belongs, by the window out to the fountain. They’ve likely moved it by now (they move this one often), but there’s another Segal installation just further in the room, by the Roy Lichtenstein piece, the yellow and black pyramids, opposite Frank Stella’s Union Pacific (another one I really can’t understand –I like the visual, but I completely miss the reason for the title…). I don’t think that’s in the permanent collection, but it hung there for many years. It’s not my style, but it’s an old friend, hanging there in it’s terminal greyness. This link will show you some of the rest, but not all of the pieces that I remember. I haven’t even taken you through the Meier addition, the white three-storied part that is so wonderfully white and bright on a sunny day. Lots of good memories climbing those glass-bricked stairs. There’s an elevator, but you miss the experience, shuttling yourself up and down in a box like that. Much nicer to slowly wind up or down the stairs, and get a feel for the environment as you go. On the bottom floor used to be this enormous, ominous, heavy leaden piece –by Anselm Kiefer. He left it untitled, but it’s so full of feeling, a title would almost reign the imagination in too much. You can see it via the link -it’s the grey one with the twisted metal ladder rising from a series of railroad tracks. That’s a pair of ballerina slippers tied to the bottom of the ladder. You really can’t see it well from the link at all. It’s one you really have to be in front of to appreciate. And there was the one that made me laugh when I first saw it, because I first encountered it around the time of that disastrous ceramics class –it’s a mosaic of sorts, composed entirely of broken plates -china and stoneware and teacups. I can’t find the artist’s name right now, but I could look for hours at the different types of plates and china, wondering where and what kind of meals were served in those plates before they became fine art. What conversations did those dishes overhear? …I think like that sometimes. Old houses make me think the same thing. I’ve sat in hundred-year-old houses and imagined a woman with bobbed hair and a flapper’s dress walking through the door, or a mom in a June-cleaveresque dress standing at the sink doing dishes. I wonder what sort of furniture or wallpaper used to be in the living room, the bedrooms. I like the history of old things. Sometimes I do think things, objects, have a sort of voice about them. Speaking of that, it’s not there now, but there was an exhibit here, on the bottom floor, around the corner -you could see it from the balcony on the second floor and take it all in, or go downstairs and walk around it and in it –it was a series of paper sculptures, all in lines, stone grey –hollow, every one. I thought to myself immediately of the holocaust, having just read Anne Frank’s diary for the second or third time, but I doubted myself –just my immediate impression. The time I first saw this exhibit, I was with some relatives of a person my dad did business with –I was set to the task of showing them around Des Moines, and since I know that place better than many others in Des Moines, I took them there, of course. This was about the early ’90’s if I remember correctly -and the couple I showed around the museum was from eastern Europe. I’m guessing they would’ve been in their youth during the second world war. We stood there in silence before this exhibit, from the second floor balcony. As I wandered over to read the artist’s name and the title, I watched the couple. There was something about this piece –and with a few sentences of broken English, they confirmed that my suspicion was right. It was the artist’s depiction of the emptiness of the holocaust. We went to the bottom floor together and walked around it in reverence. Somehow, he’d gotten it just right, for someone who lived through the war years, and me, who had only read about it. I don’t remember the artist’s name, but I’ll always remember the sense I had walking around those dull grey egg-carton-paper sculptures, each with a different face and distinguishing features, but every one hollow. From a distance, so completely alike, standing in even rows facing forward, walking to nowhere. He didn’t need to make six million of them for you to perceive the vastness of loss. There was no mistaking the message, if you were paying attention. Well… I suppose I’ve wandered around enough now. Time to head home. Figured you wouldn’t mind if I took you along with me -usually when I wander these halls, I do it by myself. I’ve taken my daughters a few times, once when my oldest was just a baby in a stroller, lifting her up so she could see Automat a little closer, and the details in that Sargent painting, and the Grant Wood painting that hung in the same hall, around the corner. Can’t have a museum in Iowa without a little Grant Wood homage, of course, but there’s so much more I remember from there. Oh, and we missed the stacked wet-dry vacuums –the one that caused quite a bit of controversy a few years back. It’s sort of the Anti-Grant-Wood. Apparently some folks weren’t too pleased that the Art Center dumped a princely sum to add this shrine to modern household appliances to their permanent collection. I suppose I do sort of get the artist’s point -it’s like a little vacuum family, encased in Lucite. A statement on twentieth-century materialism. Papa on the bottom, Mama above, and little Junior on the top. Still, there’s just enough Iowa in me to agree with the dissenters. If you’re going to spend a million or so on art, maybe you could get something that didn’t come from Sears. I enjoyed the tour. Thanks! You know it so well Shelbi. The Des Moines Art Center is right up the road from our home and I feel like I have just been introduced to an old friend of yours. I remember a few times going there with you and Amy when you were children and later, and telling you how I didn’t “get” some of the art pieces and you would explain how to view them from the artist or painters perspective. Good writing! !